Deal of the Day: Get Your Inaugural Mapkerchief! The Inaugural mapkerchief is just $9.95 from Rand McNally. Hope and change are free. Not since Di and Chuck's royal wedding have we seen this much merch milking a single historical event (how much merch? So much that Gawker felt the need to devise an Official Obama Merchandise Classification System). 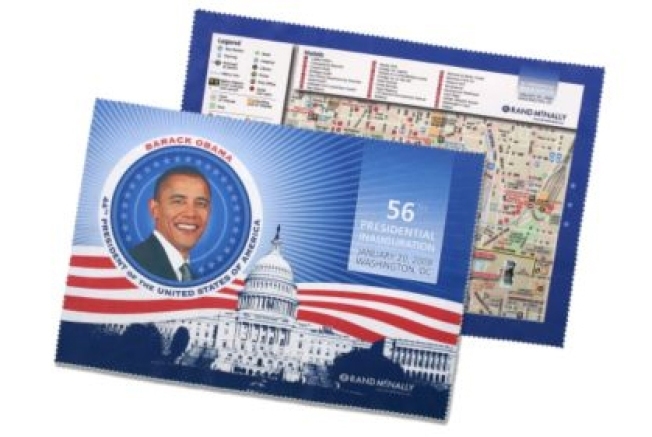 But we think the "limited edition President Barack Obama commemorative Inaugural fabMap®" - on a handkerchief! - may be our favorite. This is no phoned-in piece of historically-resonant crap. For starters, it's made by Rand McNally, mappers extraordinaires, so you know the thing will be accurate. It features Tuesday's parade route as well as all of D.C.'s monuments and sites of interest - including notable restaurants and shopping! - so it'll be a handy navigational tool long after the confetti's been cleared. Each fabMAP® ships with a certificate of authenticity, lest some profiteering scallywag try to hoodwink you with a fake inaugural mapkerchief. And last but not least, it'll keep your hair in place when the winds of change start blowing. Get the Inaugural fabMap® for $9.95 at the Rand McNally online store.